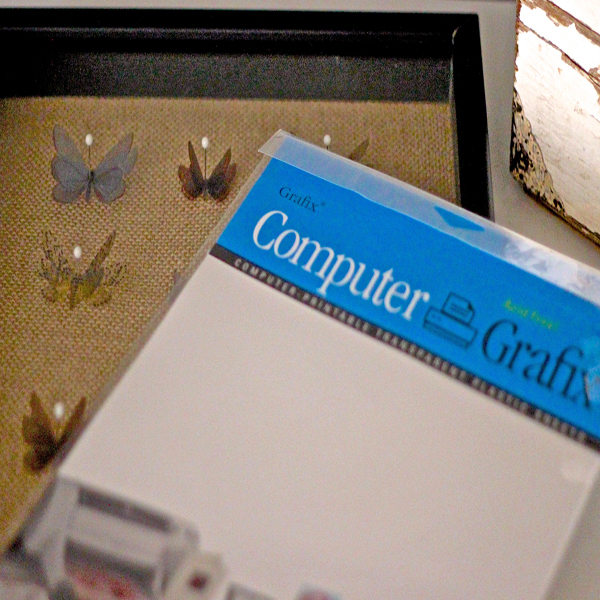 Project Description: Make a gorgeous vintage-inspired butterfly collection using Computer Grafix Inkjet transparency film. Place it in a shadowbox for classic elegance, or leave it unframed for shabby chic charm. This project looks great in a shadowbox, but it’s also very pretty unframed. If you choose a shadowbox select one with a foam backing. Otherwise, a piece of foam core poster board works nicely for this project. I’m using burlap for the background, but white muslin would also be beautiful. 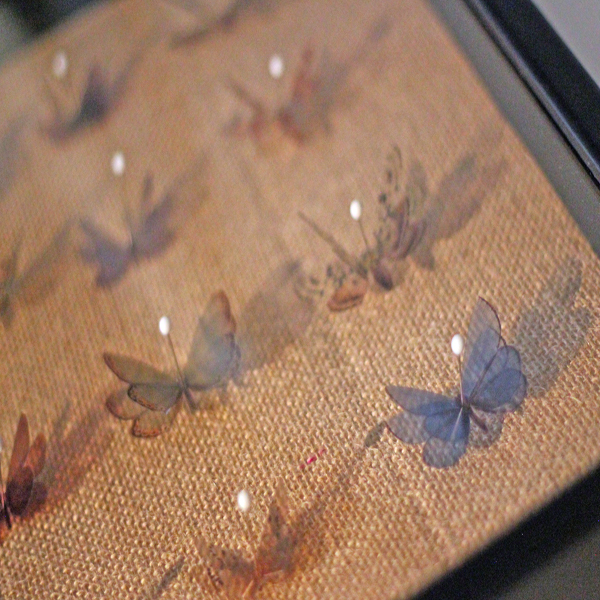 I’ll be using ball-point pins to tack down the butterflies; try to find pins that are on the shorter side so they’ll fit behind the glass. The most important supply is Computer Grafix clear Inkjet transparency film. Finally, you’ll need a hot glue gun, as well as glue dots. Place the foam board on top of the fabric. Trim the fabric so it’s about 2 inches wider than the board on all sides. Trim the corners slightly at an angle to reduce bulk. Iron your backing fabric with steam. If you’re using burlap, it can be helpful to spritz it with a water bottle. Place the fabric beneath the foam board. Add a line of hot glue on the back of the board, and then fold up the edge of the fabric. Repeat for the other three sides. I’ve made a free butterfly printable using vintage public domain images I found on theGraphicsFairy.com. You can find the PDF by clicking on the link in the video description. If available, set the media option to transparency on the print setting menu. Feed the film into the printer so that the ink prints on the rougher side. 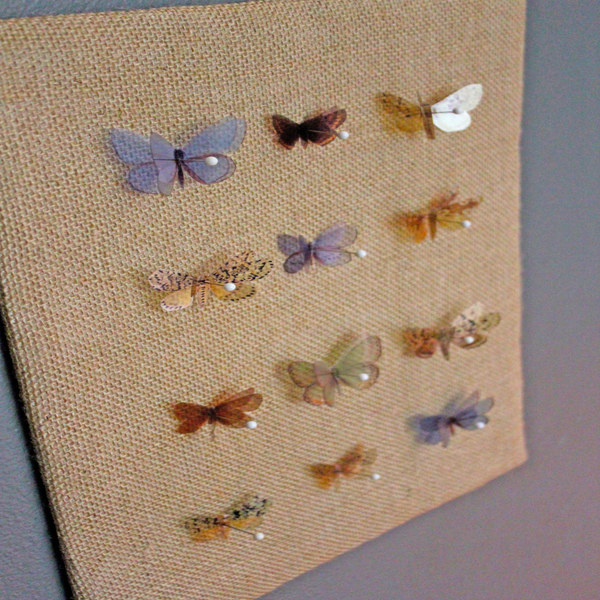 You’ll notice that there are 12 butterflies, with 2 copies of each one, for a total of 24. Cut out two matching butterflies. We’re going to use the rougher side, as it has fewer glares. Fold one of the butterflies in half, creasing the wings. Add a glue dot to the smooth underside, in the middle of the body. Then press onto the rough side of the matching butterfly. Bend the wings on the top butterfly upward. Stick a pin through the center of the butterfly, and then slide the butterfly up the pin a bit. Repeat the previous steps to make as many butterflies as you like. Position the butterflies in a grid. Foam board is lightweight and can be hung with poster mounting tape. 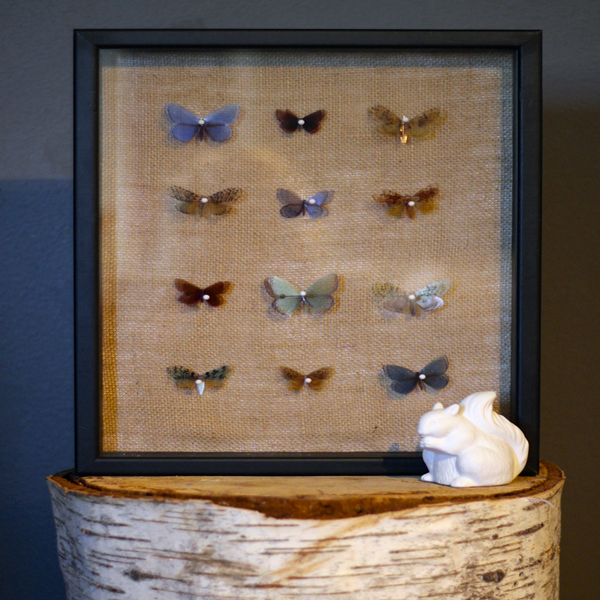 Or, place this butterfly collection in a shadowbox for an elegant decor piece.